Prosecco is Italy’s answer to Champagne, it tastes sweeter, making it an excellent sparkling wine for a celebrations. 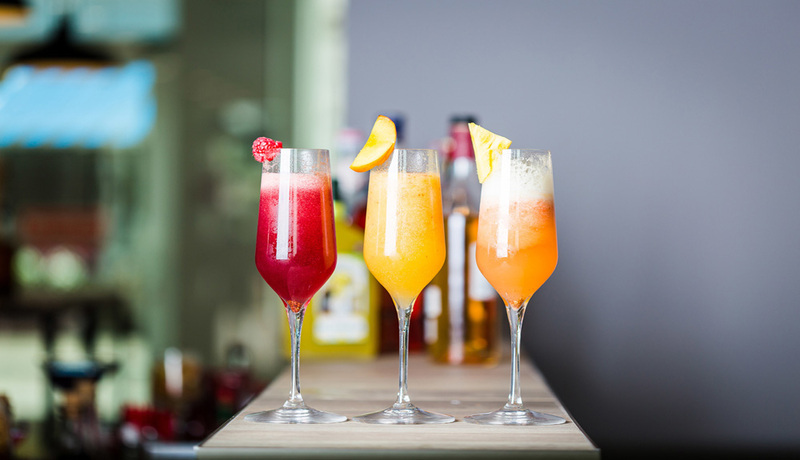 If you’re looking for some Prosecco cocktail ideas, try the recipes below. While Champagne tends to be dry, Prosecco is all fruit and flower. The fruity, blossomy aromas of Prosecco make it an excellent choice to pair with sweet appetizers and cured meats, as well as with Asian dishes, like sushi. Simple syrup is basically sugar water and it’s super easy to make. 1. Add the sugar and the water to a saucepan and allow the mixture to come to a boil. 2. Allow the boiling to continue until the sugar dissolves. Let the mixture then cool until it is room temperature. 3. Store in the fridge. This recipe combines Prosecco, with the kick of gin. •	3 TBSP of gin – approximately 1 1/2 oz. 1. Peel the lemon, making a twist from the peel. 2. Add the lemon juice, the sugar syrup, and the gin to a cocktail shaker. Top that off with the ice and shake for 20 to 30 seconds. 3. Pour into a Champagne flute, using the shaker’s strainer. Top it off with the Prosecco. 4. Garnish the glass with the lemon twist. This is a variation on the drink above; it takes all of the ingredients listed and then adds elderflower cordial to the mix. Each liquor is equal parts cordial, lemon juice, and gin. Top the drink with the Prosecco and garnish the glass with the lemon twist and some mint leaves. A pitcher of Margaritas of them is a great way to celebrate the sun going down for the day. This Prosecco margarita recipe adds a little sparkling wine to this drink classic. 1. Add all of the ingredients to a pitcher, except the Prosecco. Make this base up several hours before you’re ready to drink it. Put it in the fridge to allow it to chill. 2. When it’s time to serve the drinks, rub the rims of the margarita glasses with a lime wedge, then dip the glasses in margarita salt. 3. Pour equal parts of the ‘rita mix into the glasses. Top each margarita with a dash of Prosecco, making sure that each glass gets the same portion of the Prosecco. 4. If the drink turns out to be too tart, add some simple syrup. If it’s too sweet, squeeze in some lime. 1. Cook the berries, plus the sugar water together, mashing the berries as you go. Keep this mixture on the heat, until it becomes thick. 2. Strain out the berries, using a mesh kitchen strainer. 3. Add the limes, mint leaves, berries, and the berry syrup to your cocktail shaker. Then add in the rum and the ice. Shake the mixture up. 4. Pour the berry mixture into the glass, using the cocktail shaker’s strainer to keep the berries from dropping into the glasses. 5. Top this off with the Prosecco to taste. Want a simple after-dinner drink that tastes like dessert? This sloe gin and Prosecco fizz fits the bill nicely. Basically, all you need is a bit of sloe gin in a glass. Add in your favorite fresh berries to taste. Top the drink off with your choice of Prosecco. The sweetness of the berries and the Prosecco give this nice hint of tartness. Try one of these cocktails today to liven up your favorite get-together party.